Your fresh salad will just taste better when you pour your dressing from our hand painted oil and vinegar cruets in a vegetable garden design. Look at all the matching pieces that go with this unique set. 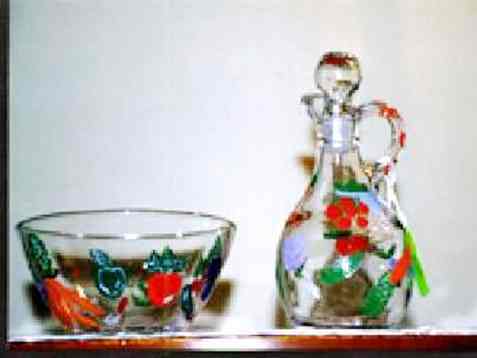 We offer a wide variety of hand painted olive oil cruets to match that these would make great housewarming gifts, and surely will delight The Cook in your life. If you love carrots then you will love this vegetable garden design full or rich oranges and various shades of green. Be sure to check out the whole hand painted salad sets.